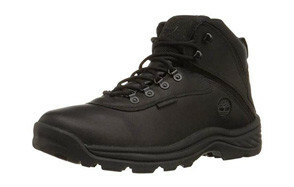 The White Ledge Men’s Waterproof Boot from Timberland is one of the outstanding hiking boot values on the market today. Handsome, comfortable, with a durable all-purpose rubber sole it’s the waterproof boot you need for all your wilderness adventures. The removable dual-density EVA footbed and padded collar also make it easy to wear around town or when you need to clear a foot of snow from the driveway. The White Ledge expresses all the values that make Timberland the standard of recreational and work-related footwear excellence: versatility, durability, comfort and style. Where some work boots impose themselves on your feet the Timberland Men’s 6” Premium Boot with its SensorFlex technology responds to your feet. It’s a remarkable feeling and one that is going to spoil you against other brands going forward. These work boots are designed to be worn outside in the gnarliest conditions where their generous insulation and waterproof characteristics will carry you through the day without a care. The Timberland PRO Men’s Powertrain Sport is a low cut safety shoe with a tough fiberglass shank that keeps things true without having to be stiff as a steel plate. It’s all part of the proprietary Anti-fatigue technology at work in the outsole that lets you wear the Powertrain Sport all day long as you hustle between the office and the shop while never skipping a beat. They’re lightweight, abrasion resistant and the composite protective toe guard keeps those piggies safe in any environment. For more sprot shoes check out our top Nike sneakers review. Here’s another example of the versatility of the Timberland collection of men’s footwear. The Flume Waterproof boot will serve you just as well when you mount that earth mover as it will when you sling your backpack over your shoulders before heading off into the wild. The fully waterproof leather upper is comfortable right out of the box and the gusseted tongue makes sure nothing weasels its way in. The EVA midsole adds comfort and shock absorption and the solid rubber sole provides a sure grip on every surface. You can check other waterproof options in our top Gore-tex boots guide. We take a step back from heavy duty footwear with the Timberland Men’s Classic Two-Eye Boat Shoe. 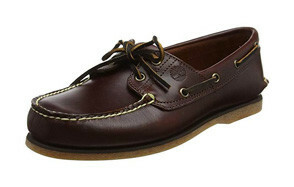 The Two-Eye boat shoes looks like any number of other leather shoes but the minute you slip them on you realize they’re in a league of their own. They feel great from heel to toe. The full-grain leather upper is supple and forgiving right from the box. While the non-marking sole provides the grip you need when you’re slapping through waves on a close haul or walking down a rain-slickened sidewalk. Our handy guide to the top boat shoes features more great shoes like this. Designed ostensibly for fishing the Timberland Altamont Sandal would seem just as at-home at the mall on Saturday afternoon or at the 4th of July deck party. It provides beau coups support all around and is well ventilated and light like a sandal should be. When the weather is warm you’re going to find yourself reaching for these all the time. The polyurethane midsole provides the support, the rubber outsole provides the grip and the reinforced nylon shank won’t set off alarms at the airport. The Men’s Disruptor Oxford is another hyper-versatile shoe from Timberland. With a tough alloy toe protector and removable insole it protects and cradles your feet at the same time. It’s water resistant, stain resistant and designed to be worn all day. The clean lines and unadorned exterior, combined with the proprietary Anti-fatigue outsole technology means you can wear it in the office or in the shop. Be sure to also check out our list of the top Under Armour shoes for more great items like this. 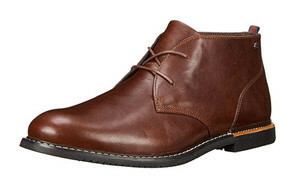 The Brook Park Chukka leather shoes from Timberland are more than just a trip down memory lane. They’re one of the most comfortable, stylish casual boots the company makes. They embrace the minimalist profile of the traditional chukka boot but elevate matters to a higher plane with the Gripstick™ outsole, premium leather uppers, cotton laces, quadruple stitching and leather heel accent. Both the linings and the outsole also include high percentages of recycled material so it’s a green boot as well. The Powertrain construction shoe is a fresh take on the long established work shoe design. If it wasn’t for the steel safety toe you’d probably think it was hiking boot, and some might even use it for that. (These are warm weather work boots though, so don’t wear them into the woods in the winter.) The Powertrain is comfortable, durable, abrasion resistant and features the company’s Anti-fatigue outsole technology. It’s also breathable in a way a traditional winter boot, or one with tons of insulation, simply can’t be. The Killington has a one-of-a-kind look you won’t find in any other men’s shoe that we’re aware of. Somehow though it works, both from a design and a functional perspective. The mesh toe and full leather heel play off each other beautifully and the Vanilla Chocolate Chip sole adds just the right amount of levity to tie it all together. Functionally it’s extremely comfortable and features the company’s SensorFlex™ technology with antimicrobial insoles to prevent foul odors. Love these shoes? Check out our review of the top walking shoes for our top picks. Versatility - Timberland shoes like the Powertrain Sport and the PRO Disruptor Oxford profiled above are just as comfortable at work as they are in the park, on the trail or at school. Versatility is one of the hallmarks of the entire Timberline men’s footwear collection and we give extra weight to those models that best express the company’s ethos of far reaching applicability. Design - Timberland did not invent any of the shoe categories it dominates today. So we don’t expect them to revolutionize footwear design, but we greatly appreciate all the ways they continue to improve existing forms. Quality - Lack of quality is almost never an issue when it comes to Timberland shoes. Typically if someone is complaining about a Timberland shoe or boot falling apart it’s because they have purchased one of the many knockoffs flooding the market without realizing it. Price - Timberland shoes and work boots are not cheap. But when you consider the quality of the materials and workmanship that go into them they are one of the best footwear values you’ll find, period. Below we’ll take a look at some of the features you’ll want to look for when shopping for Timberland shoes. Size/Fit - Timberland boots and shoes have a history of fitting a bit large. Meaning if you typically take an 8 1/2 shoe or boot you should consider trying an 8 when it comes to Timberland. This is not a hard and fast rule but just a word of advice. 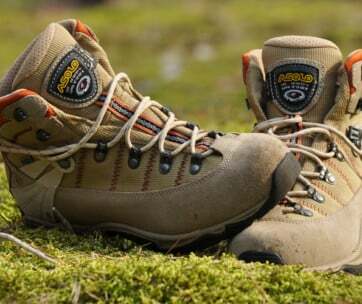 Comfort - Whether boat shoes, hiking shoes, work boots or Timberland sandals their footwear is known for its comfort. Their SensorFlex and Anti-Fatigue technologies create some of the most comfortable shoes around. Chances are very good you’re not going to have any issues with the comfort of your Timberland shoes. Material - Timberland shoes are typically made using first class materials including genuine leather and suede, rubber, wool, down and on occasion, fur. The company is also committed to responsible sourcing and, as an example, make sure all their leather products come from cattle raised specifically for food purposes, rather than just to be skinned. After being acquired by VF in 2011 Timberland adopted the new parent company’s proactive sourcing guidelines. Durability - When you’re looking for hiking or work shoes in particular you want to be sure they’ll stand up to the challenge of job or trail. When you inspect a pair of Timberland boots you’ll notice triple and even quadruple stitching, beautifully sealed seams all around, robust stainless steel eyelets and genuine Vibram soles. Weight - Weight becomes a factor when it comes to hiking and work boots. Being on your feet all day whether on the trail or on the jobsite is draining enough without your boots acting like a pair of concrete blocks at the end of your legs. Timberland offers a variety of different boot styles at a variety of different weights. Make sure you don’t ignore this important consideration when purchasing your hiking or work boots. Waterproofness - Whether work boots, hiking boots or boat shoes it’s important that your shoes are able to stand up to the elements. Being cold and tired is bad enough, but being cold and tired and having your feet sloshing around in sopping wet shoes or boots redefines discomfort. Fortunately, Timberland was a pioneer in the development of waterproof shoes, a tradition they proudly carry on to this day. Protective Toes - Not such a big concern where boat shoes and Timberland sandals are concerned but very much an issue when it comes to work boots. Timberland offer a huge variety of different style work shoes and boots with either steel or composite reinforced toes that offer maximum protection from worksite hazards. Judging by the level of market penetration and cultural visibility Timberland footwear enjoys today you might be tempted to think it was always this way. Actually, it’s been a long and winding road to success for Timberland and one that has benefitted from being in the right place at the right time. In 1952 a man named Nathan Swartz purchased a 50% share in what was called at the time the Abington Shoe Company. At that time Abington mostly made shoes on contract for other companies. After 3 years of getting to know the shoe business and assessing Abington’s potential Swartz bought out the rest of the shareholders in 1955. By the late 1960s Abington had outgrown its facility and moved into a larger one in Newmarket, New Hampshire. Abington changed its name to Timberland in 1973. Innovations and new product lines followed in the late 70s and by the mid-80s Timberland was experiencing rapid expansion both at home and abroad. They opened a new factory in Tennessee and entered the European market; first in Italy and then spreading across the continent. By 1985 they had sold their 1 millionth pair of shoes. During the 1990s the company continued to experience rapid expansion and ventured into other products including watches, backpacks and more. Their popularity exploded when high visibility rappers began wearing Timberland boots in music videos and on stage. At first the company rejected this new market but in time came to see the wisdom of embracing alternative demographics. In 2006 they bought the Welsh clothing company Howies and expanded their product footprint in the UK. Finally, in 2011 Timberland was purchased by VF Corporation for nearly $2 billion. Q: Why Choose Timberland Footwear? Quality materials - No one who knows better is going to dispute the quality of materials that go into even the simplest pair of Timberland shoes. Genuine leather, wool, rubber, cotton as well as high quality acrylics and more mean your Timberland footwear isn’t going to suffer material fatigue 2 months after you unbox them like many other shoes will. Quality workmanship - No other brand of mass market footwear can compete with the build quality on display in Timberland shoes. Even after 30 years and more of aggressive expansion the company has not lost sight of the standards that made their name in the early days. They’re cool - What’s that? Work boots are cool? You better believe it. After initially offering a cold shoulder to the rappers who were making their footwear products a household name in the 1990s Timberland finally came around to the wisdom of not biting the hand that was feeding them. Today they collaborate with a number of streetwear brands, sponsor rap tours and point proudly to their product when it appears in hip hop videos. Q: How to Maintain Timberland Footwear? 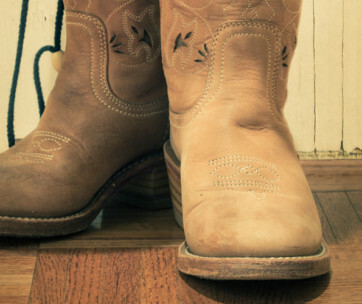 A: When you purchase a pair of Timberland shoes or boots it’s important that you know the right way to care for them. Leather - If you have purchased leather Timberland boots we recommend you get acquainted with their Waximum Waxed Leather Protector. This waterproofing treatment is easy to apply and works to soften and protect the leather without compromising the breathability of the footwear. One word of caution: don’t use it on suede or nubuck. Suede and nubuck - For suede and nubuck there are a number of different ways to care for your Timberland shoes. 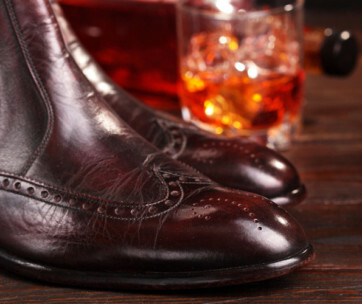 Shoes that are lightly soiled can be cleaned with a nubuck cloth which has a special cleaner built into its fibers. Timberland also makes their own nubuck and suede restoration items that can be purchased through their website. Canvas - Canvas shoes typically suffer most at the hands of water. While leather shoes, suede and nubuck are no fans of water themselves it’s canvas that takes the hardest hit from H2O. Not to fear though, your canvas Timberlands don’t need to rot out from under you. To begin with canvas fabric typically has acrylic fibers woven into it these days which help repel some water. Beyond that though there are dozens of different shoe protector sprays commercially available and the sooner you apply such a product after purchasing your canvas Timberland shoes the better.